(A lot). Then I’ll show you what to do! Or at least what I do. I’m a self-proclaimed savings queen. I get a high out of getting a great deal on something and knowing I didn’t pay full price. The more I save, the higher on cloud 9 I go! I always tell my husband, “don’t buy anything without a coupon (code)!” He makes fun of me sometimes when I get back from a Target haul, find a precious $10 off coupon at home I forgot to bring, and threaten to pack everything back up to get my $10 back (I’ve done it before 😂) but hey, I save us money!!! And who doesn’t love that? Now I’m no extreme couponer because I really don’t have the time and don’t use many mainstream products that seem to generate a lot of coupons, but I’m always on the prowl for getting a buck or three off and not paying retail. So insert the beautiful store that is …. (drum roll please) …. Home Goods. And Marshalls. TJ Maxx. And not to leave out good ole Ross. 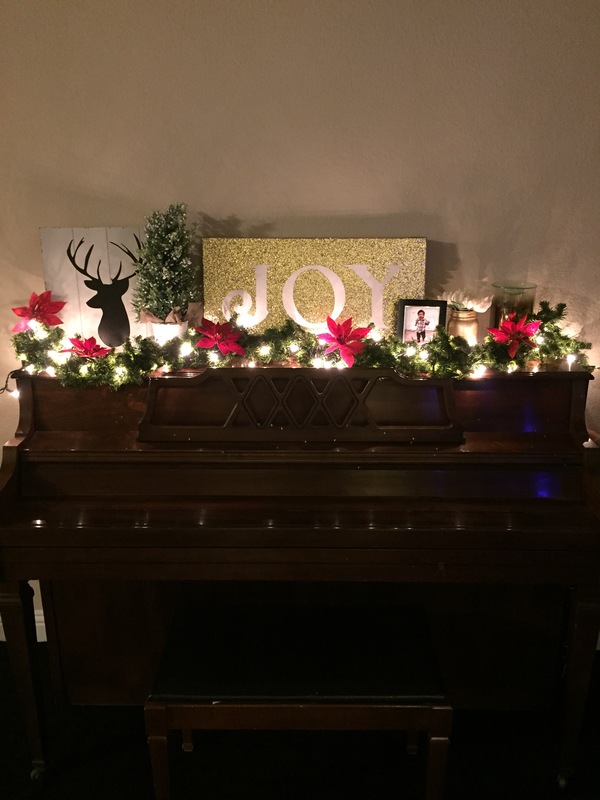 That’s how I created this “modern meets classic” piano decor on the cheap! 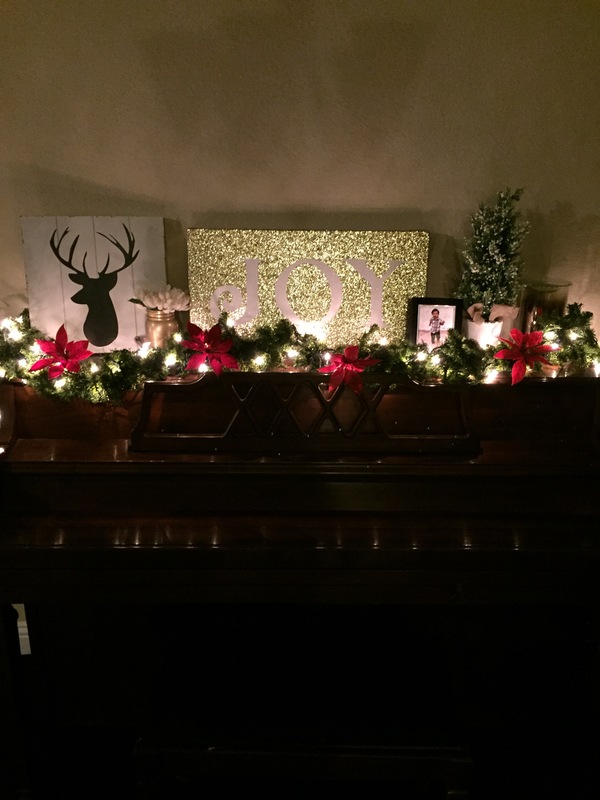 If you’re a little more on the OCD side and want that balance, (like me!) here’s an alternate arrangement for you! 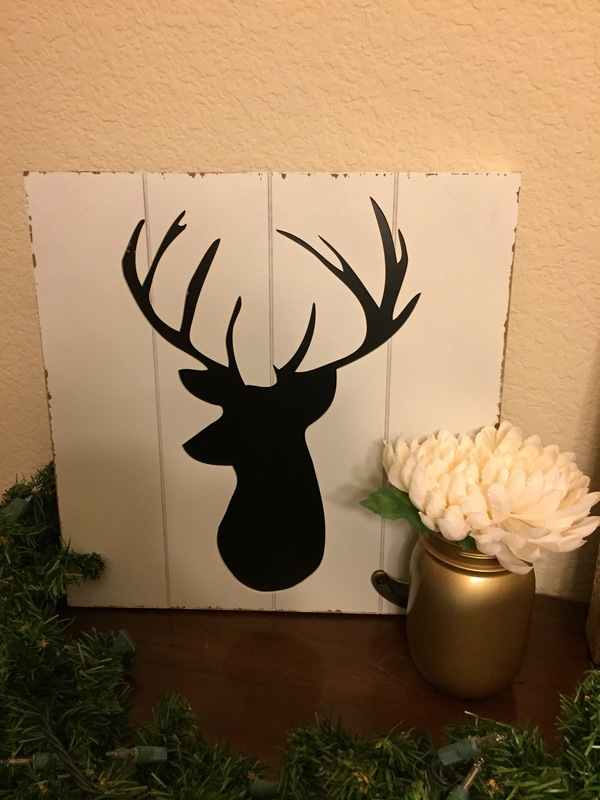 Deer are all the rage this season from decor to fashion to party themes! (I may or may not be throwing a deer themed party soon- stay tuned). This little guy came from Home Goods for a whopping $5.99! Yes, you read that right! $5.99! I love how it’s lightly distressed and looks like planks of wood- two things totally in right now. Not to mention, deer and reindeer are timeless Christmas pieces you just can’t go wrong with- they’re too cute! You may not find this exact piece now, but as of two days ago, there were plenty of great deer pieces to choose from! Oh, oh, oh, and the cute gold flower vase beside it that goes with EVERYTHING? $5.99. Marshalls. You’re welcome! I actually bought this last Christmas at Ross for $12.99. (Crazy cheap, right?!) I loved it, but didn’t like the idea of putting a hole in my wall to hang it for only a month or so. I went to return it but lost my receipt so it was only worth $3 and some change. Worth more to keep it, so whipped it out this year and found the perfect spot for it (no holes needed!) I saw more this year at Ross so go get you one! 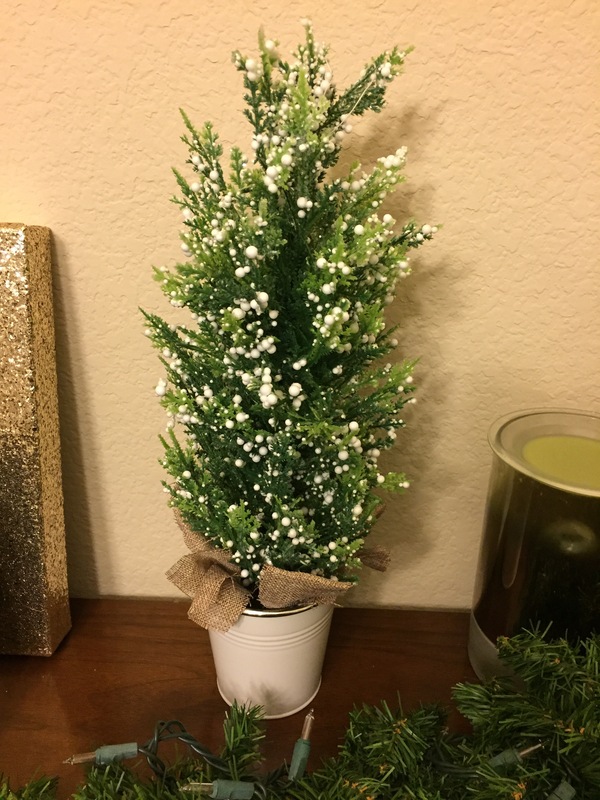 I saved my favorite for last which would be this adorable little tree! It’s about a foot tall and came from Marshalls. I actually JUST made myself put it away around June because it’s honestly a piece that could work year round. I love the neutral elements it has with the bright burst of fresh green. This color green amongst neutrals really brightens everything up and just makes it feel like Christmas! Oh… and it was $6.99. Shut up, I know. Now I can’t leave out my good friend Target because when it comes to adorbs decor, they KILL it. Every. Single. Time. 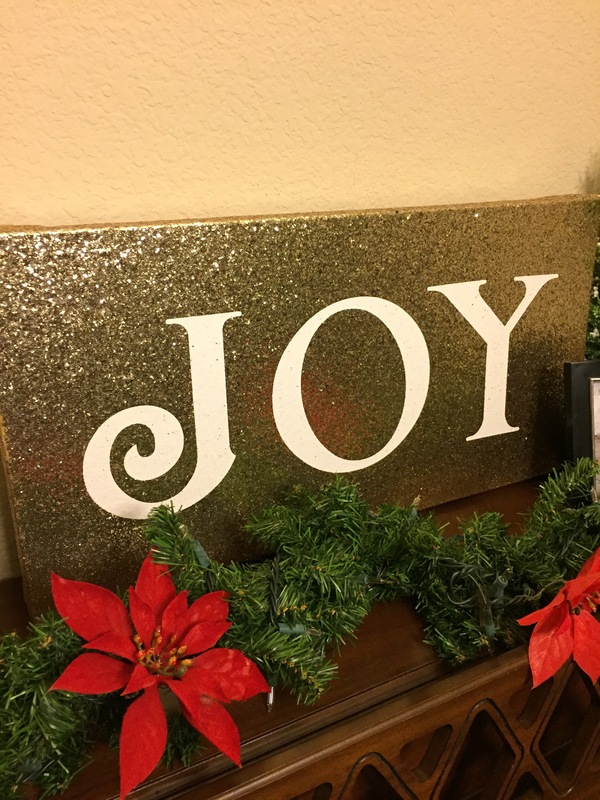 However, they aren’t always the cheapest when you have loads of other things to buy, BUT the Cartwheel app often has home decor deals and so do the emails they send to people on their list. So sign up. I also have their Red card linked to my debit card which saves us an additional 5%! So get out there and shop cheap so you can bless others with what you save! That’s always my goal. Where are some places you find amazing home decor deals? Previous Post Hello from the outside. Next Post Quick Winter outfit ideas featuring your new Vest friend! For $13! I’ve seen the ads for it! What are your fav things to order? I haven’t gotten any. But every time you purchase you get a promotional period of free shipping for 30 days. And it starts over every time you order.